The Ring sets are here! The New York Times has the story. Frankly, reading about hydraulic machinery, steel girders, and a brand new room to house thirty-two (!) computers causes me a shiver of pragmatic worry about finances. Zerbinetta over at Likely Impossibilities has voiced reasoned doubts about other aspects of the production as well. But if this comes off... it would be so exciting. My only exposure to Robert Lepage so far has been through his Damnation de Faust at the Met last autumn, which left me, on the whole, favorably impressed. 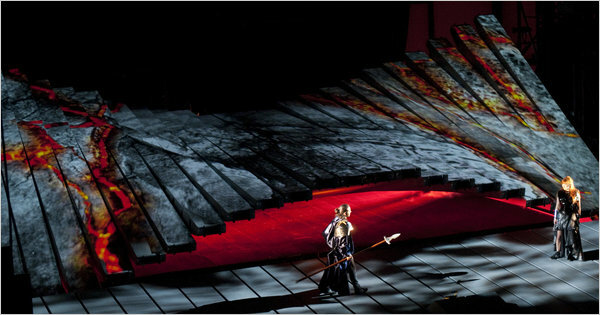 A fine instinct for theatrical spectacle and striking, stylized imagery will, of course, get one a great deal further with Berlioz' Faust than with the Ring. Lepage himself has been quoted (repeatedly) in Met programs describing the Ring, enthusiastically, as containing its own universe. One is tempted to snap back, "Of course it does, Mr. Lepage! What are you going to do about it?" I should be hoarding my stipend and beefing up lecture notes in these last weeks of summer... but the Mostly Mozart festival has begun, and I could not resist its siren call! As always in the wake of these reckless concert-related decisions, I'm inexpressibly glad I went; surely lecture notes will be the better for my brain and heart having absorbed some Mozart beforehand? The program notes were unusually lively, as well as informative, maybe stretching a little too far in its attempts to convince us that all the evening's music shared a uniting theme both natural and profound, but still good. Jane Moss, the festival's director, claims in the program booklet that it is hard to imagine "a more sublime and rewarding way to experience summer in New York than celebrating the genius and inspiration of Mozart," a sentiment which, while perhaps overly fulsome, I find hard to argue with. Last Sunday, I was given a real treat: not only did I get to see the exciting 1970 Karl Böhm Fidelio for the first time, but I got to do it in the company of a friend who was at least as excited about it as I was. The extreme closeups of the television filming I found occasionally jarring (possibly in part because of Marzelline's anachronistic eye makeup?) but it was a moving performance. Josef Greindl's Rocco, here, I found much more vivid and engaging than in the 1963 video I mentioned earlier. My heart still belongs to Christa Ludwig, but Gwyneth Jones' Leonore was fresh of voice and firm of purpose (go here for her "Abscheulicher!") James King's Florestan was, I thought, of irresistible vocal beauty. The chorus wowed me: they were lump-in-the-throat expressive as well as impressively precise, and not only that, but the prisoners' pathos survived the camera close-up with flying colors. Böhm's orchestra seemed to be an expression of the characters' heartbeats, their most private thoughts translated into sweeps of sound. A few of the spoken dialogs were omitted, and I missed them (I like my Singspiel!) but the entire thing had a breathless emotional urgency which I loved. I could not be more thrilled by the rapturous and nearly universal acclaim with which Bryn Terfel's recent role debut as Hans Sachs has been greeted (photo: Catherine Ashmore for WNO.) Just a few of the effusive reviews stem from Classical Source, the Wall Street Journal, and the Financial Times. Intermezzo has not only a detailed review, but lots of pictures!) Mr. Terfel is an honorable member of the group of opera singers who compose my Pantheon of Imaginary Uncles. (Domingo heads the list, but there are others as well.) Here is an irrelevant but winsome German interview. You cannot fool anyone by singing Evil Baritones, Mr. Terfel; irrepressible likeability will out. The Proms performance of Meistersinger will be broadcast live on BBC Radio 3 this Saturday, at 4:00 London time which means 11:00 a.m. for me. It will then be available on demand for a week. (Full details here.) I'll be sorry to miss the Richard Jones production, but still, I will get to hear the avuncular Mr. Terfel sing, or channel, Hans Sachs. I really do have other interests besides opera and the study of medieval history... cooking, for instance, and fencing, to cite examples which may add verisimilitude to an otherwise unconvincing narrative. But sometimes my opera obsession will not be sated by recordings alone. Being an avid reader of novels whenever possible, I turn to fiction, with, so far, mixed success, but mostly a lot of searching without finding. Gentle Readers, do you have favorite novels which touch on this favorite art form? Recommendations are eagerly solicited. Some of my discoveries are below. I'm supposed to be spending these languorous summer days planning lectures, and I am, mostly. But New York, eternal temptress, lured me out this past week to the Philharmonic's "Summertime Classics" series. As a side note, I was surprised both by the series' aggressively "accessible" marketing campaign, and by its apparent success: the average audience age seemed to have dropped by several decades from my usual NYPhil experiences, and also seemed more diverse in almost every conceivable way. Apparently, the series is the brainchild of some NYPhil higher-ups and the conductor who presided over all the events, Bramwell Tovey. I was wary of the label "conductor/host," but Tovey turned out to be not only a spirited conductor, but also overflowing with erudition which he seemed eager to share in a non-patronizing way. The catalyst for the series? Tovey's conducting of Webern's Symphony, Op. 21, back in 2001, which he decided to introduce with historical context and catchy anecdotes to intrigue and pacify the audience. I fear this may be a Terrible Indictment of New York audiences... but I didn't find the format offensive, and if this does work as a successful gambit, I'd love to feel less alone in the under-50 crowd on those (admittedly somewhat rare) occasions when the symphony does steal an evening of my free time away from the Met.